A number of brands have joined the efforts to help out those affected by the floods in Chennai. 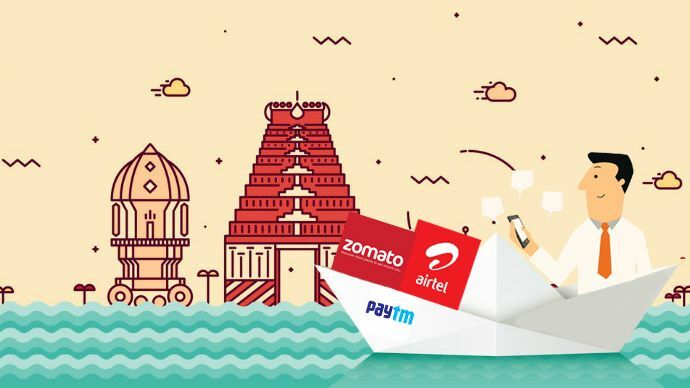 E-commerce platform Paytm, cellular companies BSNL, Airtel and restaurant search and discovery service Zomato have come forward to help the victims of Chennai floods. E-commerce platform Paytm, which mostly focuses on mobile recharge and e-wallet facilities, has taken a centrestage with its 'Stay Safe Chennai' initiative. "If you would like to recharge anyone's mobile number so that they can remain connected during this tough time, please call us at 18001030033 and share the mobile number. 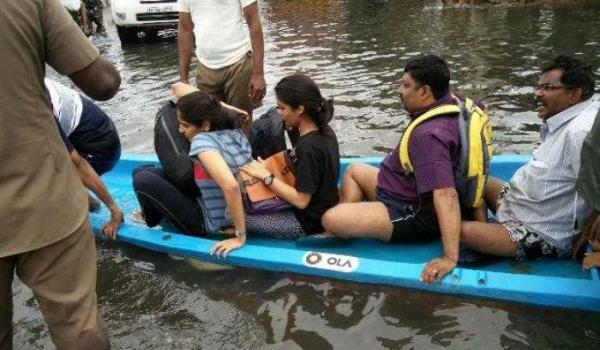 As incessant rains have disrupted life in Chennai, the latest company to help out stranded people in the flood-affected areas is telecom giant Airtel. The company has announced a few measures to facilitate communication between people in the region. Airtel has announced both auto-approval of talktime credit of up to Rs 30 and free credit of 10 minutes for Airtel-to-Airtel calling for all prepaid customers. The facility is valid for two days. Apart from free talktime recharge, Airtel is also offering 50MB of mobile data - valid for 2 days- free of cost for all its prepaid mobile customers. 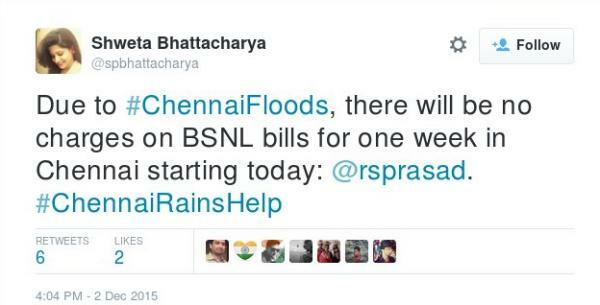 Public-owned telecommunications company BSNL is also doing its bit to help out Chennai. Telecom minister Ravi Shankar Prasad announced that there will be no charges on BSNL bills for one week, starting today. People also tweeted out in support of the initiative. Restaurant search and discovery service Zomato has launched a meal plan for Chennai flood victims. Zomato has come up with a customised offer called 'Meal for Flood Relief'. Zomato CEO Deepinder Goyal took to Twitter and announced the initiative. 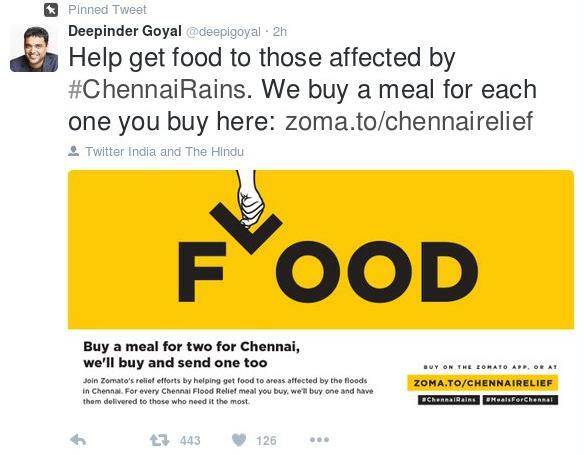 According to the offer, if someone buys a meal for Chennai flood victims, Zomato will add one to it and send two meals instead of one where people are stranded. Also, the price of the meal is quite economical. A meal for two costs Rs 100, while a meal for four is priced at Rs 400. A lot of restaurants in Chennai, including Adyar Ananda Bhavan, Prems Graama Bhojanam, Kolapasi, Dindigul Thalappakati, Nawab Sheikh Biryani, Meat and Eat, and more have come forward to participate in Zomato's initiative. In November, Taxi operator Ola deployed boats along with professional rowers to rescue people in the waterlogged areas to safer places. Also, they were equipped with two rowers, sufficient umbrellas and could ferry between five to nine people in a trip.